Ten years after Stacker Pentecost (Idris Elba) helped close the breach in the Pacific Ocean, his son Jake Pentecost (John Boyega)returns to the Pan Pacific Defense Corps to help train a new crop of Jaeger cadets in case the Kaiju return. Our take: Don't waste your time. Post credit scene? There is a "beginning of credits" scene. If you haven't seen the first one, don't worry this movie gives you a quick recap in the first 60 seconds. At the same time, if you haven't seen the first one, watch it instead of these 111 minutes of giant "Rock 'Em Sock 'Em" robots. The first movie was not without its faults, but at least it was watchable. This sequel has none of the heart, emotion or intrigue that the first one had. What made the original film exciting and interesting was the newness of it all. 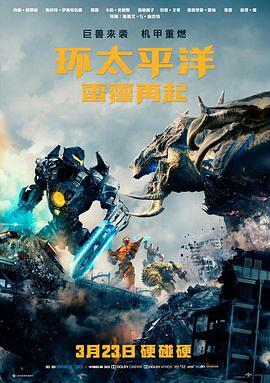 It was a new take on the Kaiju genre. It was a new and interesting way to utilize giant robots. The aliens were cool. What made the original film exciting and interesting was the newness of it all. It was a new take on the Kaiju genre. It was a new and interesting way to utilize giant robots. The aliens were cool. The doomsday anticipation was intense. The talent was impressive - Elba, Rinko Kikuchi and Charlie Hunnam (as Mako Mori and Raleigh Becket respectively) were strong in their roles and helped viewers ignore any missteps the film made. And sadly, no sequel was ever going to be able to capture any of those things in the same manner. Even so, we expected more than the bad writing, hanging plot points, and poorly-developed characters and lackluster relationships that we got. Boyega is fairly believable as Elba's offspring - except for the fact that the character came literally out of nowhere. And while otherwise there's generally nothing wrong with his portrayal and he's decently charming, he alone does not have the Elba charm to carry a film surrounded by weak castmembers. Scott Eastwood (as Nate Lambert) is nothing more than a pretty face in the film. He doesn't fit his role as a soldier and commander and certainly doesn't play well off of Boyega in the role of frenemy/buddy. But the lack of chemistry doesn't stop there. Cailee Spaeny is quite impressive in her debut role as Amara Namani, yet the character ultimately falls flat due to the same lack of chemistry with Boyega. Her storyline basically amounts to a poorly copied reiteration of Mako's story from the original without any of the heart. And while the rest of the teen actors aren't necessarily bad, they are also not utilized much in the film, have zero backstories or character development and ultimately serve as nothing more than plot devices needed to drive robots. Even Charlie Day (as Dr. Newton Geiszler) failed to impress. There is one improvement from the first film and it is the cinematography. The fight scenes are beautiful to watch and are masterfully staged. Yet, without a half-decent plot, coherent dialogue or emotional stakes, they aren't worth the two minutes of occasional thrill. On top of that, this is the first film where we can actively say the sound mixing is genuinely treacherous - while the dialogue was nothing to write home about, we did want to hear it and that was made virtually impossible half of the time. Featuring: A female character that has no purpose except to facilitate an unnecessary love triangle that isn't even explored.